​Welcome! Thank you for your interest! CEM internships are not like any other internship. Read on to learn more about what CEM interships entail. CEM offers internships for committed Christians age 21 and older who love the Lord and are eager to serve others. (United States citizenship is required.) Ministering to these hurting young people is both demanding and rewarding. Students experience rapid growth, and interns develop additional spiritual maturity and endurance. As servant-leaders, interns model the Christian life as they live and work alongside the students. A staff of committed Christian professionals who have had many years of residential ministry experience provide guidance for the intern team. New interns receive one week of orientation, verbal and written instruction, and helpful direction and advice from senior interns. Internships range from 90 days to 2 years. Each intern disciples one to three students and teaches group Bible studies on a rotation basis. 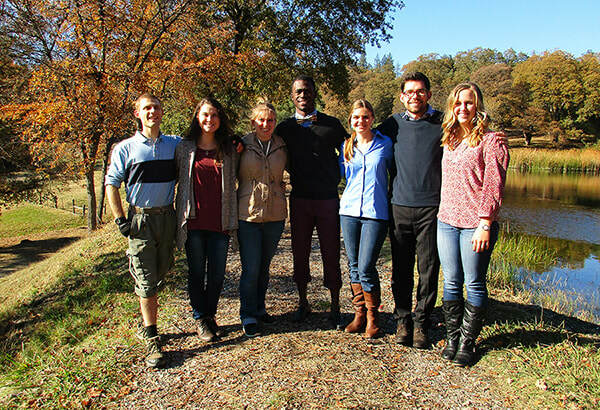 Interns are hard-working supervisors of the students and perform daily assignments that include practical activities--cooking, cleaning, and various maintenance tasks on our 86-acre campus (affectionately called “the Ranch”). Interns also oversee a dorm room with two or three students. Many teachable moments arise during the daily activities as well as during recreation times (e.g. boating, swimming, fishing, hiking, ball games, “hanging out,” etc.). There are also various opportunities to minister in other ways according to interest and gifting. ​Depending on length of stay, interns may accompany the students on a wilderness trip (under staff guidance) in the high country of the Sierras: a two-week late summer backpack trip which includes rock climbing and rappelling, and/or a 4-day winter snow trip. These experiences foster teamwork and character development, and nearly everyone who goes on a trip returns having heard from the Lord in a deep way. "My time at CEM has been more challenging, stretching and rewarding than I could have hoped for...I am overwhelmed by God’s goodness, faithfulness, forgiveness, discipline, and love that I have experienced and seen this year." “Tending lives, Training leaders” is the motto of Christian Encounter Ministries. “Tending lives” refers to what we do for our resident students. “Training leaders” refers to what we provide for our Interns. CEM interns are not assistants, bystanders, or errand-runners; they are the front-line healers in this ministry to broken and hurting young people. As such, they are given much responsibility and authority. Total involvement in the ministry, coupled with the direct support and guidance interns receive from each other and from the staff, creates a powerful learning experience. However, interns are not just thrown into the fire; new interns transition into the role. The first week after arrival they shadow seasoned interns to learn the ropes. Even after the training time, the other members of the team help where needed to provide a smooth transition into the schedule for new interns. And since it’s a team ministry, the team shares the weight of the responsibility. Interns receive extensive leadership training during their time at CEM—from on-the-job experience, from senior members of the intern team, and from the CEM staff. This training includes monthly sessions on pertinent topics related to ministering to damaged young people as well as weekly group and individual sessions. Interns are also assigned a spiritual partner/mentor to meet with weekly. Interning at CEM is not easy; with responsibility and authority come challenges. But no life-changing work happens without sacrifice. Working at CEM is, as Paul wrote in 2 Timothy, “being poured out as a drink offering.” But the best part is that the students grow spiritually while interns develop leadership skills. In accordance with our motto ("Tending lives,Training leaders"), interns are under-shepherds, but CEM also serves as a training ground for interns as future leaders elsewhere in the Kingdom of God. Working at CEM equips interns to be change-makers in the world! By definition, leading involves relationships. The most effective leaders are the ones who care enough about those they are leading to build relationships with them. Interns work closely with their small group of co-leaders—people with similar missions but with different personalities and backgrounds—thereby learning the importance of every individual as they bring their own unique gifts and abilities to the team. Interns draw from each other's strengths and this compounds the effectiveness of the whole team, and therefore, the ministry. The intern team, however, is just one part of the larger CEM community which also includes our “students” (the residents of our program), staff, and members of the CEM church. Living in this tight community adds to the depth of relationships. When interns see all sides of the resident-students, it is much easier to understand them, and therefore easier to minister in a way that reaches their hearts instead of merely addressing their actions. "​The most effective leaders are the ones who care enough about those they are leading to build relationships with them." Another special aspect of CEM relationships comes from the 24/7 nature of the ministry. Interns have a large sphere of influence on the students and have the joy and challenge of being with the students in all capacities. Where a teacher is limited to the classroom and a coach is limited to team activities, interns are presented with teachable moments throughout the daily tasks of living. Having the opportunity to constantly sharpen the iron of those around—and in turn be sharpened—is intensely challenging, yet encouraging, and ultimately deeply fulfilling. Interns develop deep relationships. Because the relationships are deep, the leadership built on those relationships is strong, and the ministry effective. ​The opportunity to be so immersed in a vibrant community like CEM, a microcosm of the body of Christ, is rare and valuable. It's an opportunity to learn to see beyond someone’s behavior, and even beyond their character, to the soul—and to learn to love that soul as Jesus does. Internships may begin nearly any day of the year, depending on openings at the time. ​To learn more about CEM Internships, please visit our Internship Details page, call (530) 268-0877 and ask for Jensen, or submit a Request Info form.